AUTOMATICALLY Try our Screen Saver which Backs up your important data files on your computer. It's one of the only useful screen savers around! Our new software for retailers of Cell Phones, Pagers, Satellite TV. Click here for more info! Use our screen sizer to test any web site (or page) to see how it would look in another screen resolution. Is your AntiVirus program up to date? This tutorial explains how anti-virus programs work. Evaluate one of my classes. 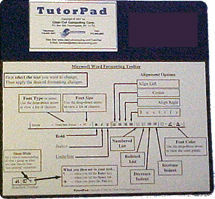 The mouse pad that teaches! Support Plans Need support for your small business computer needs? We can provide network setup, computer maintenance, software support (including setup and training for QuickBooks®) and more. VidiTalk Video Email - with plans starting at just $29.95 per month. Spam Soap to rid you of annoying, unwanted emails. Remote Support Now we can come to you through the Internet! By remote connection to you your computer, you can watch as we fix your computer, train you, and more. Prices start at $19. Web Consulting & Design Put your business on-line for the whole world to access - 24 hours a day, 7 days a week? From the simple, affordable website to more sophisticated sites that include interactive databases. We try to find the best deals on computer hardware, software, and services. Visit our new online Computer Mall for great deals from Dell, QuickBooks and more. Computer TrainingOnline classes for many of today's popular software is available. Our online classroom, you will hear the instructor speak to you, see his computer screen, and be able to ask questions. Classroom training, One-on-one and customized training are also available for individuals and groups. Valuable information for Parents and Children from the booths we have setup at shows and the presentations we have done.